-Supported Codes: UPC-A，UPC-E，EAN-13，EAN-8，ISBN/ISSN code 39，Codabar，Interleave 25，Industrial 25，Matrix 25，Code 128，Code 93，Code 11，MSI/PIESSEY，UK/PLESSEY，UCC/EAN128,Fedex, UPS, USPS,etc. -Compatible Operating Systems:Windows XP / Win7 / Win8 / Win10，MAC OS,Google Android, linux. 【USB Wired + Bluetooth Wireless Mode】Connect wirelessly via Bluetooth for added mobility, or benefit from a stable, wired connection with the included USB charging cable. WBS1003 default Bluetooth wireless mode, you can switch to USB wired mode by scanning setting bar code. our attached Bluetooth receiver will make it easy to transmit data on notebook, computer phones and other Bluetooth. 【Support a Variety of Scanning Methods】Support Manual scanning ,Auto Scanning, Auto continuous scanning and so on, function settings only need to scan code(included) can be easily achieved. Built-in memory chip, when it is in the Inventory mode, you can remotely operate the bar code stored in flash (About 3500 14b id barcodes), then upload data to computer when you are back. Support for prefix and postfix operation. 【Safe and Reliable】The key parts are made of high elastic engineering shock rubber with high friction, effective resistance to external pressure, protect the device against falls. The lifespan of the high rebound button is long to 5,0000,000 times. Built-in 750mA Li-battery, standby time is long to 3 months, any USB 2.0 port can charge the barcode scanner. 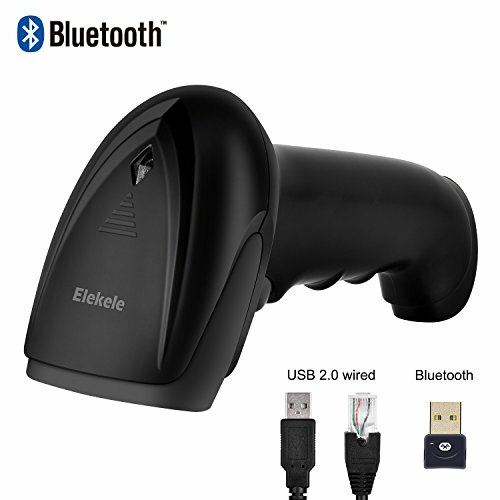 【Warranty】Elekele focus on providing good products and service, 1 year warranty from the date of purchase. If there is any issue, please feel free to contact us. If you have any questions about this product by Elekele, contact us by completing and submitting the form below. If you are looking for a specif part number, please include it with your message.